U.S. President Donald Trump says Iran risks serious consequences if it makes more threats against the United States. Trump’s words were written in large letters as part of a Twitter message. It appeared on Twitter Sunday night. While tensions between the countries have increased, both sides have reasons to want to avoid starting a conflict that could easily intensify. In this photo released by official website of the office of the Iranian Presidency, President Hassan Rouhani attends a meeting with a group of foreign ministry officials in Tehran, Iran, Sunday, July 22, 2018. Trump’s comments followed a series of speeches and communications meant to incite unrest in Iran. U.S. officials say the Trump administration wants to pressure Iran to end its nuclear program and its support of militant groups. Iran has faced increased U.S. pressure and possible sanctions since May. That is when Trump announced his decision to withdraw the United States from a 2015 international agreement over Iran’s nuclear program. “America should know that peace with Iran is the mother of all peace, and war with Iran is the mother of all wars,” Rouhani said. The Iranian state news agency IRNA reported his comments. Rouhani also made fun of Trump’s threat to stop Iranian oil exports. 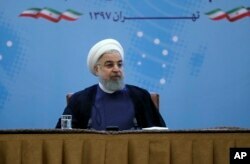 He said Iran has a leading position in the Gulf and the Strait of Hormuz, a major waterway for oil shipping. A commander of Iran’s Revolutionary Guards reacted to Trump’s threats by saying his country would continue to resist its enemies. Iran’s Students news Agency ISNA reported his comments. Trump’s warning to Iran came hours after a speech by U.S. Secretary of State Mike Pompeo. Speaking in California, Pompeo described Iran’s religious leadership as a “mafia.” He also promised support for Iranians unhappy with their government. 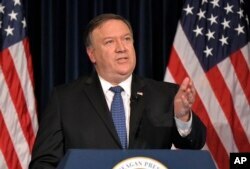 Pompeo said that the government has become a nightmare for the Iranian people. He urged all U.S. allies to join in financially suppressing the government. Iran reacted to Pompeo’s speech as interference in its affairs, the semi-official Tasnim news agency reported. There is little interest among United States lawmakers for a conflict with Iran. U.S. officials note the difficulty the military faced in Iraq after its invasion in 2003. They also are concerned about the effect on the world economy of higher oil prices. Many Iranians are worried that the war of words might lead to a conflict. But observers in Tehran told the Reuters news agency that the U.S. administration would not bring the country into another quagmire in the Middle East. Warren Strobel and Parisa Hafezi reported this story for the Reuters news agency. Susan Shand adapted their story for VOA Learning English. The editor was George Grow.